Participate in our cross-country race series. Enjoy winter running and a great community event. Be inspired by casual, social runners out for the enjoyment and record-breaking athletes testing their limits. To facilitate, foster and promote distance running for pleasure, fitness, competition and sportsmanship. To serve as a network for socializing and as a forum for discussing matters affecting the interests of runners. To advocate on matters of interest and concern to runners in their pursuit and enjoyment of running. We are a diverse group, from casual, social runners to elite athletes. The club has members of all ages, from the teenagers who get hooked on our cross-country races, to the septuagenerians still running marathons, and the octogenarians, who continue to hold national speed records for various distances! Grand Prix cross-country series – 10 races throughout the fall, winter and spring months of 4 and 8 km distances. Each race is preceded by a kid’s race, weather permitting, and followed by soup, desserts, and socializing in a local community center. Monthly Club Night Runs – an easy 5 to 8 km run followed by drinks and dinner in a local Calgary pub. It’s at a different location each month, so check the Club Night schedule. The Original St. Patrick’s Day Race – a fun 5 and 10 km road race event, now starting it’s 4th decade, early in the year to start off the race season. Calgary Women’s Run – a 5 km and 10 km race for women of all ages. 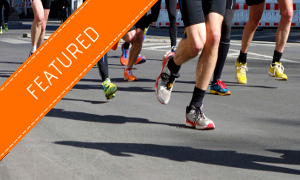 Robert Hamilton Memorial Run – challenge yourself with the classic 5 and 10 mile distances commemorating one of Calgary’s best runners from the 1970’s. After 43 years running, a decision was made by the Executive to cancel this event in October, 2017. Annual General Meeting – we elect our Board of Directors for the coming year, have dinner and an inspiring presentation from one of our numerous local elite athletes. Cross-Country Awards Dinner – an annual social evening event to recognize the dedication, perserverance and skill of our large cross country running community resulting from the Grand Prix Race series over the previous winter. We have coaches who can assist you with your first running experience or to achieve your race time goals. We also offer an opportunity to meet other runners who want to run on a regular basis for fitness and enjoyment. Our training groups meet for interval and hill training throughout the week and for short and long distance runs on weekends. You can always find someone who shares your personal reasons for running or philosophy on the sport!